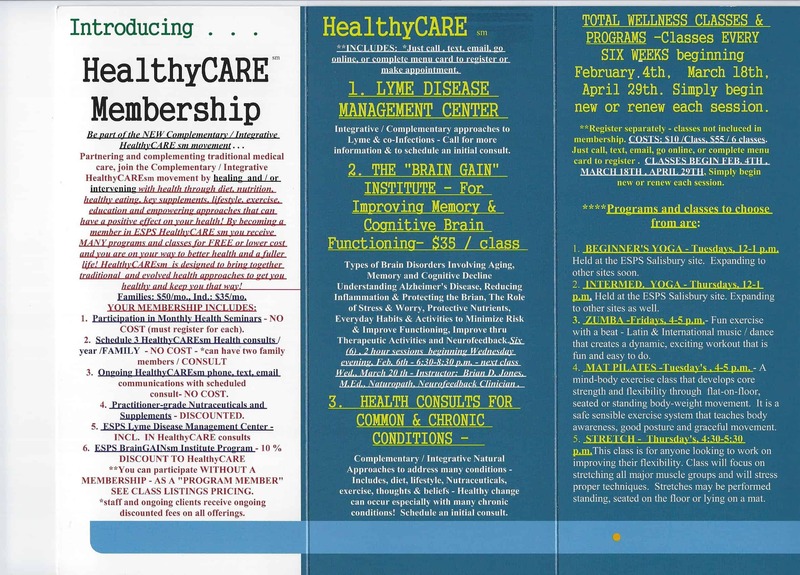 To Register for HealthyCare Membership, please complete form. Lyme Disease Management Center -Yes!! I am interested in initial consult. Please contact me. Regular Health Consult for Common & Chronic Conditions. Please Contact Me. I want Neurofeedback!! Please Contact me. To register for Saturday Health Seminars, after completing this form go to "ESPS Total Wellness Monthly Seminars" under ESPS Total Wellness. $10/Class Classes Tuesday 12-1pm (Held at ESPS Salisbury Site) See Brochure for more details. $10/Class Classes Thursdays 12-1pm (Held At ESPS in Salisbury) See Brochure for details. $10/Class Classes Tuesday 4-5 pm (Held at ESPS in Salisbury) See Brochure for details. $10/Class Classes Tuesday's 4-5 pm See Brochure for details. $10/Class Classes Thursday 4:30-5:30pm See Brochure for details.